‘Daughters of the Goddess’ begins with the author recounting this question, which she posed to a Pandit in India many years ago. The Pandit was surprised. 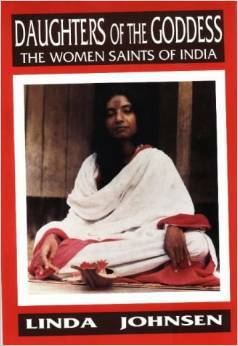 “There are thousands of lady saints in India. You think because there are no books about them, they do not exist.” This conversation seemed to have spurred Linda Johnsen into action, and serves as a backdrop to this fascinating and highly readable book, consisting of a selection of stories, insights, accounts and interviews of great female Hindu saints from ancient to modern times, as well as an explanation of Goddess philosophy in the Hindu tradition. Thus ‘Daughters of the Goddess’ reveals the feminine face of Hinduism in all its glory. There is particular emphasis on accounts of contemporary female saints, with the intention that sincere individuals can actually seek out and meet these tremendous women if they so desire. The author takes great pains to point out that meeting enlightened teachers in real life is much more fascinating and rewarding than just reading about them in books. Overall, Daughters of the Goddess is an engrossing and charming book. At only 128 pages, and written in a lively and fast paced format, it is sure to reach out to a wide audience. The only downside is that the liberal use of technical Sanskrit terms may baffle some readers (although this is remedied by the glossary). Overall, however, I am sure that this book is destined to change many lives, and highly recommend it to anybody sincerely interested in the subject matter.